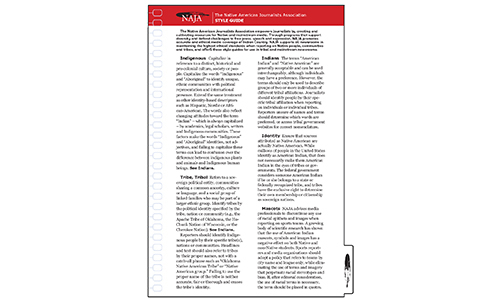 The NAJA Style Guide provides style guidance on preferred Indigenous and Native American terminology. It is printed on a heavy card stock and has a die-cut perforated edge that snaps into the spiral bind of the AP Stylebook. The Native American Journalists Association is a registered 501(c)3 nonprofit charitable organization.